Rennes-le-Château and the Château de Montségur are two must-see attractions outside Toulouse, but organising transportation independently cuts into valuable sightseeing time. On this tour, spin through the countryside in comfort with your guide and visit both sits in one day. 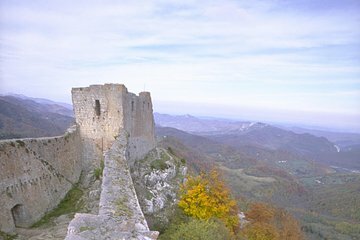 Learn of the mysteries and 19th-century conspiracy theories for which pretty Rennes-le-Château is famous, and follow the Cathar road to Château de Montségur—where spectacular Languedoc scenery awaits.